What a day for a coin show. The October 14th Sunday morning began with overcast skies but then turned into a beautiful day with temperatures in the 70s. First, here's a big Welcome and Thank You to all of the coin dealers and to all of the visitors who attended the coin show. Many of the regular dealers came to the show even though several of them has just been at the Rome coin show. But, a few of the regular dealers had schedule conflicts, and guest dealers took their tables. The many coin dealers filled the bourse with a variety of numismatic treasures. Visitors packed the bourse aisles during the peak times. Some visitors came to buy and/or sell. Others browsed looking for that perfect addition to their collection or just to see what piqued their interest. Some people, both dealers and guests, traveled long distances for 2+, even 3+, hours to visit the show. On a different note, a coin dealer from the metro area visited the coin show. He shared a recent experience with a gentleman visiting his shop to sell silver bars. He described beautiful silver colored bars encased in strong plastic holders. 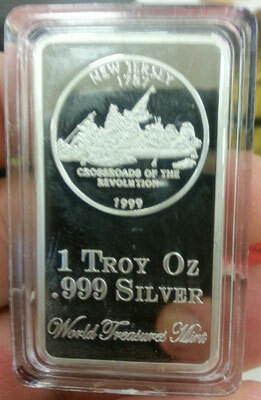 In addition, the front of the bars noted .999 silver, and each bar weighed the 1 Troy ounce as shown. But, the bars were not silver. Others in the area braved the weekend road construction in the metro area with the accompanying delays. We appreciate all of you who came to the coin show. A representative of the Smyrna Coin Club stopped by the coin show and shared their club's plans for a display at the Smyrna Fall Jonquil Festival (Oct 27 & 28). They plan to be there on Saturday, and may have their booth available on Sunday as well. Stop by to meet members of the coin club and to learn more about the club and what it offers both experienced and new numismatists. 1874 Seated Liberty Quarter with arrows at the date in a PCGS holder identified as PF64 Cameo. This coin contained beautiful rose-colored reverse toning. Of course, this list represents only a small sample of the many numismatic items on the October 2012 coin show's bourse. We hope you visited and saw some of the above items. With buying and selling at the show, other shows and their shops, many of the numismatic items the coin dealers provide for display change from month-to-month. In the above list, a few of the items sold by the end of the show. Mark your calendar and make plans to visit the 299th Greater Atlanta Coin Show on Sunday, November 11, 2012 for buying, selling and browsing numismatic items. In doing more research, the World Treasures Mint web site calls these bars silver clad bullion. In particular, this picture shows one of their US State Quarter Series for the 1999 New Jersey state quarter. In addition, their web site states this bar is "silver clad." But, the secondary market must be wary as the labeling on the bar is misleading. Be careful buying silver and gold for both the mis-direction of the labels and for the counterfeit bullion. Civil War era checks - one check written on a Cumberland Bank in New Jersey for a sum of $500 shows hand cancellation. Did you know? During the time, banks charged a tax to cash checks. $500 in the early 1860s would equal thousands of dollars in today's economic climate.